We received 3-and-a-half inches of rain in the storm that hit this region on Tuesday evening. With reports warning of wind gusts between 60 and 70 mph, we were a bit anxious about what might happen when the full force arrived. Luckily, we did not experience any loss of trees from that high of wind, but the paddocks have the makings of a couple new canyons shaped by the heavy rain. While cleaning up manure, I came across evidence of a failure I had been suspicious of for some time. The drain tube that was buried from the barn gutter to the main drainage swale has made its way up to the surface. There is no way it can be draining properly. That helps explain the dramatic runoff that has been occurring from the corner of the barn. It doesn’t really matter that I cleaned out the bird’s nest from the down spout when the drainage tube the spout is connected to is plugged somewhere down the line. After work yesterday, I disconnected the down spout from the tube that leads underground and rigged up an above-ground series of tubes as a temporary solution for protecting the paddock from erosion. I don’t know what I would do different, but the failure of that buried tube reveals a flaw in our plan. Once again I am reminded of how fluid (as opposed to static) the “solid” ground actually is. Buried things don’t tend to stay buried around here. Each spring farmers find new rocks sprouting in their plowed fields. Those rocks aren’t falling from the sky. They are pushed up from below, just like that section of my drainage tube that now protrudes above the surface. I probably won’t ever succeed in preventing erosion from runoff of heavy rains, but I would sure like to reduce and confine it as much as possible. My next idea will involve a way to capture the water running off the roof into a giant barrel of some kind. Then I just need to figure out what to do with the overflow from that vessel whenever it fills up. I paid for my neglect. Cyndie pointed out something yesterday in our back pasture as we were strolling the grounds toward the labyrinth, after visiting the horses with her parents and our kids. We had just enjoyed a scrumptious Mother’s Day brunch at our house before heading out into the cool, blustery wind. Rain had been predicted, but the pending arrival was moved to much later in the day. It’s a good thing that most of the day was dry, because it gave me a chance to remedy a situation that occurred because my failure to follow through on a plan. When the drain tile was installed last fall, it was left up to me to place grids over the trenches in high traffic areas. I didn’t do anything about it in the days after the contractor had finished his work, and then winter arrived and it all became buried in snow and ice. Honestly, I just haven’t been concerned enough about it this spring to take any action yet. Then Cyndie alerted me to how the recent heavy downpour of rain had washed away stones at the end of the line that runs into the pasture. 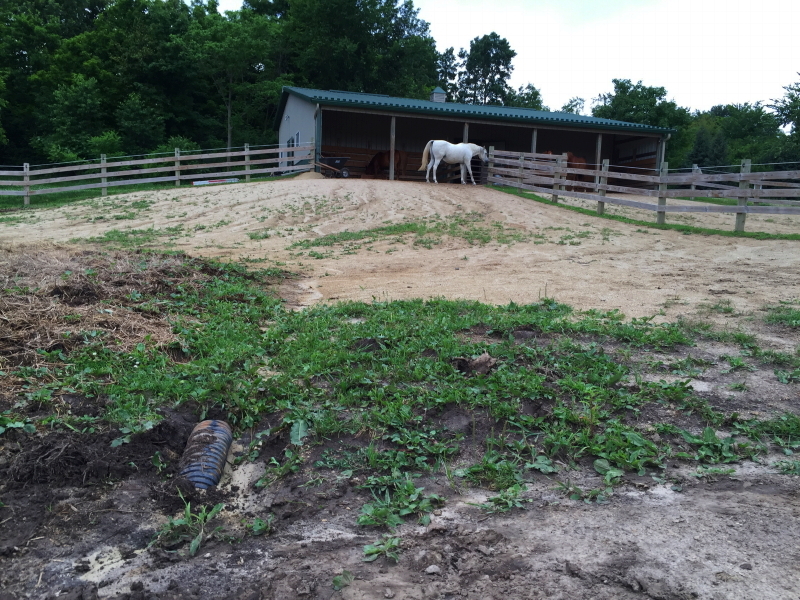 That left some of the tubing exposed, which revealed areas where the weight of the horses had pushed through the wet ground deep enough to collapse the tube in several spots. 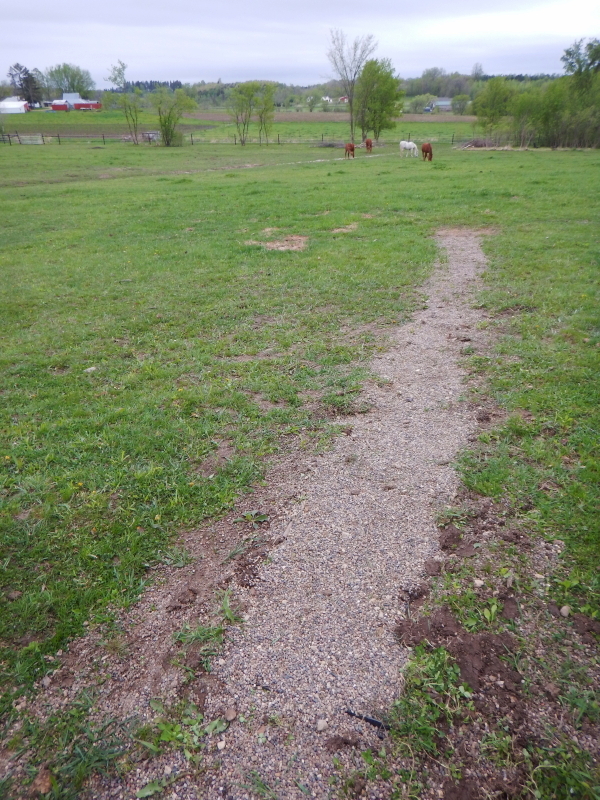 Luckily, the damage occurred at the end of the line where it just runs out into the pasture, and the installer had run the tubing far enough out that I could shorten it without putting the areas I was trying to protect at risk. As soon as visiting family departed, I set about installing the fix that was always meant to be in place. I pulled up the portion of drain tube that had collapsed and then cut it off to make a new end. We had some of the plastic landscape grids available that were left from previous projects, so I just needed to do a bit of digging to seat the grids level with the ground surface, and then backfill them with stones and dirt to keep them in place. It was quick enough work to make me regret that I hadn’t been more disciplined about just getting it done before any damage occurred. The silver lining is that I now have a chance to protect the other high traffic areas before horses will be stomping around the vicinity. The other spots aren’t as high-risk as this one in the field was. The area where the damage occurred is where the line drains to the surface, so the tubing was getting closer and closer to ground level. Nonetheless, I will be upset with myself it I don’t install the grids in the other locations before something happens again. Wouldn’t it be nice if I found out the grids were on sale? It got warm enough to melt a lot of snow yesterday. I was happy to see the drainage ditch we put in last fall is working just like we hoped it would. It’s a bit harder to know how much the drain tile is helping, since it is buried. I don’t see any obvious flow out of the ends yet, but I would assume the ground is still frozen down that low and water isn’t making it into the tubes. Once all the snow is melted, I expect to be able to see the ground drying out quicker. That will be my evidence that the drain tile is working for us. Even though I tried to be careful about where I piled snow when I plowed and shoveled this winter, a fair amount accumulated in the areas above the paddock, but downhill from the buried drain tile. 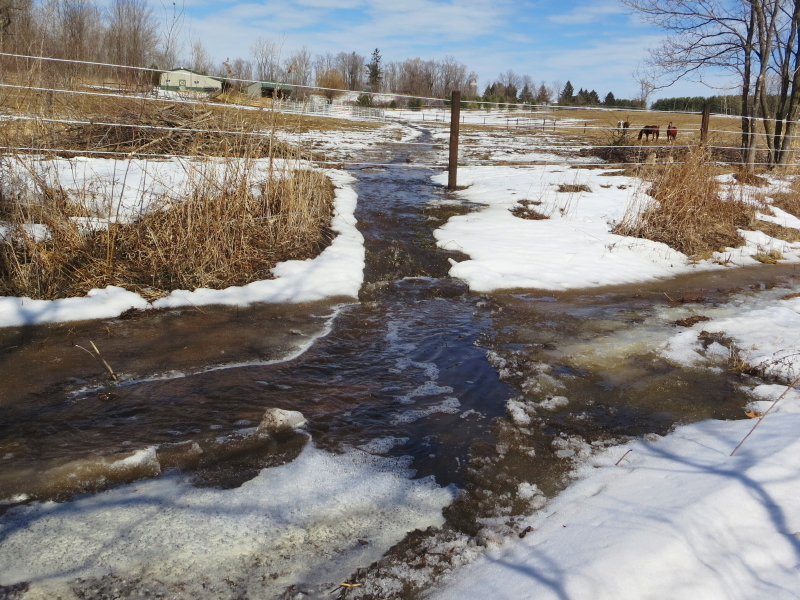 The water from that melting snow will flow right into the paddocks. Once all that snow is gone though, there should be little in the way of additional melt-water keeping the ground in there saturated. The amount of snow we had on the ground this year when the warm weather arrived was much less than we were forced to deal with last year. I consider this a pretty genteel test, in comparison, and am expecting to see good results. Although, there is also a risk that we will end up enjoying paddocks that are too dry, as a result of drought conditions, not just due to our drainage work. It would be a case of getting too much of a good dryness thing. On Saturday we enjoyed a day of sunshine with temperatures above freezing right from the start. What little snow cover we had acquired just a day prior was no match for the warm rays. I was very happy to be able to get the deck shoveled clean first thing in the morning, to take advantage of the solar drying mechanism. When it got above 40°F, I talked Cyndie into taking her walker for a little stroll on the nicely dried deck to soak up some of that direct sunlight. It helped to lift her spirits a bit while getting in some exercise for that new hip joint. As far as we can tell, the new joint is doing fine. The residual pain of the surgery is still commanding her attention, and that certainly limits her abilities for the time being. While making my rounds down to the barn I was happy to discover a glimpse of success for a portion of the drain tile we had buried in the fall. They ran a tube right off the barn gutter downspout down into the ground and buried it in a trench that runs down beyond the paddock fence. The water was flowing audibly down into that tube on Saturday, so I walked across the paddock to the outlet in the newly carved drainage swale to see what it looked like. It was working brilliantly! There was a perfect trickle of water flowing out of the pea-gravel, turning the snow in the swale a telltale gray with saturation. It is but one part of three drainage solutions which we had installed, but it gives me hope that we will see similar success in the other areas when spring ultimately rolls around. No matter how much preparation I have done for the onset of the snow season, the first significant accumulation seems to always burst on the scene when I still have too much to do. This morning I discovered news of a likely accumulating snowfall anticipated for Monday. I better get after a few things, especially moving the rest of that fresh pile of split firewood into the shed. I had hoped to get the round pen surface of lime screenings sufficiently packed so we could order dump truck loads of sand for the finishing touch. I was allowing time —as in, the passing of days— to aid in the settling. I also drove around in there on the 4-wheeler, pulled an arena drag across it, and re-raked it prior to a final packing with a tamper. I’m not confident I’ll get that done now, although it doesn’t matter so much if, with a new snow covering, we wouldn’t be able to get a truck in there to dump the sand anyway. Move the pile of left-over pea gravel that came with the drain tile installation. 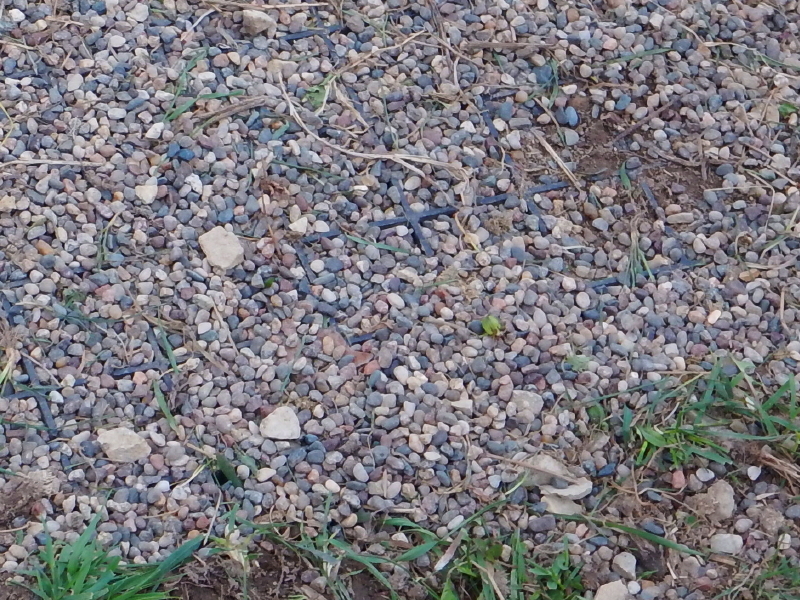 I have several potential uses for the pea gravel. Just need to commit to one. Finish the ends of small berms that were started around the paddocks when the drain tile was installed. Use up the left-over pile of lime screenings that were spread in the round pen, by packing them on the new high-spot around the hay feeder. Pull out the snow tires for Cyndie’s Audi. Re-arrange the shop garage to get the plow blades out from storage. Change the tires on the Grizzly ATV to the more aggressive winter tires. Move the deck furniture into storage. Hopefully, get that pile of split firewood moved and stacked in the woodshed. On the bright side, we are more than content about the major accomplishments we have achieved in preparation for the winter snows. With the drainage swale and drain tile in place, the spring runoff should be much improved. Also the south drainage ditch is cleared wide open for the full distance of our property. 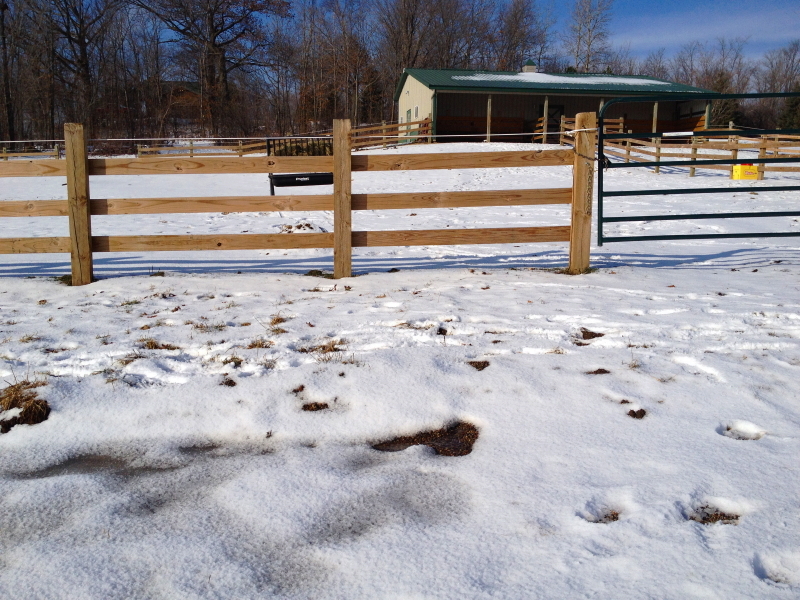 There is a fresh application of lime screenings on the slopes in the paddock, a new high spot for horses to stand on, and berms around the upper perimeters. Plus, we buried the drain of the barn gutter downspout so it will dump its water directly into the drainage swale beyond the paddock fence. With the back pasture properly fenced, we will now be able to turn them out on some higher ground, earlier in the season than we were able last year. I better get to work on the other things. That is, after I go downstairs and replace the battery in the smoke detector that has been chirping since the godawful early hours of this morning. It caused some crazy avoidance/anxiety dreams for hours this morning as I repeatedly tried to fall back asleep so as to delay dealing with it until daytime. I rescheduled a planned work day at the old job in order to be home Monday morning for the confluence of both landscaper and fence contractor arriving to work on our long-awaited projects. As Cyndie headed out the door for her work, I made some passing comment about my high anticipation, and the number of other mornings I had suffered disappointment for similar expectations. After rising promptly to eat an early breakfast, and getting outside for chores that would make me conveniently available to greet the crews, I received a call from my fence guy. They were hit by a few “Monday issues” that would delay their arrival a day. Why was I not surprised? Luckily, the landscape crew arrived and saved my day from being a bust. 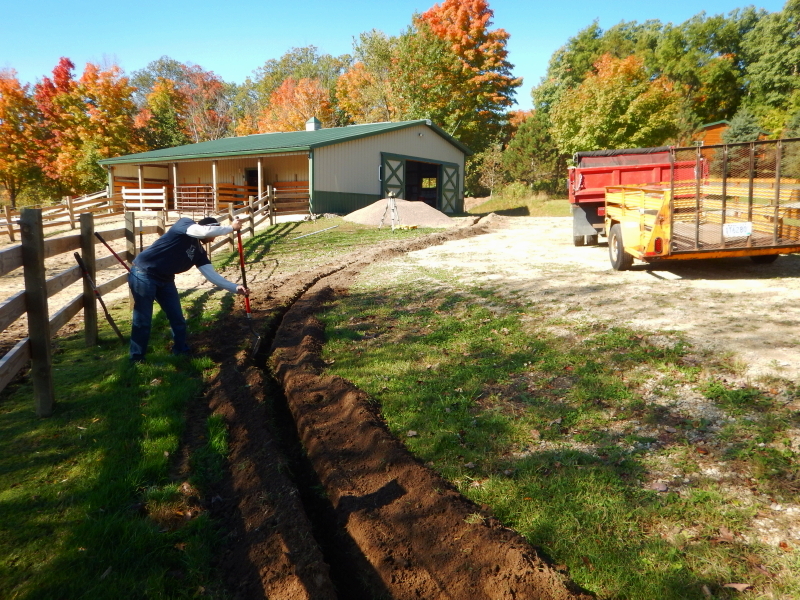 They started quickly and had the ditch created so fast that I thought the project was going to be a cinch. Then, the process of adjusting the slope of the ditch, with a laser as reference, slowed things considerably. It didn’t help that the end they needed to make deeper was through thick clay soil, which made for very difficult digging. The upper part of the run involves an easily visible drop, but the lower portion levels out. That created something of a challenge for them to achieve an evenly descending slope. When the drain tube was finally dropped into the channel and covered with pea gravel, I felt a sudden urge for more rain, so we could see how well it works. Boy, if that isn’t an unlikely thing for me to be writing… an urge for more rain.